NEW YORK (CNN) -- Chesley B. "Sully" Sullenberger III was "the right guy at the right time at the right moment" to guide a jet safely onto the surface of the Hudson River, a neighbor and friend said. Chesley Sullenberger is an Air Force veteran who has been with US Airways since 1980. Sullenberger has a cool, calm and collected style -- honed by decades of flight experience and research on safety issues, friend and neighbor John Walberg told the Contra Costa Times newspaper. All 155 passengers and crew aboard Flight 1549 survived. The 57-year-old former Air Force fighter pilot has been flying for more than 40 years, and has been with US Airways since 1980. His two-page resume is packed with achievements and highlights his broad aviation experience. Passenger Joe Hart praised the plane's crew as "phenomenal, in all respects." "Once the pilot said 'brace for impact,' the flight attendants made sure everybody knew they had to be buckled in and bent over," Hart said. "Then they sat in their chairs, strapped themselves in, and in a regular cadence, until we hit the water, they just continued to chant 'brace, brace, brace' so that nobody would sit up. And that, I think, helped prevent a lot of injuries on impact." Education: U.S. Air Force Academy, B.S. ; Purdue University, M.S. ; Northern Colorado University, M.A. CNN affiliate WKOW in Madison, Wisconsin, identified the co-pilot as Jeffrey Skiles, 49. Barbara Skiles told WKOW that, in conversations since the incident, her husband has praised the rescue effort. "He was really grateful and really impressed about the response that they got, how quickly boats were at the side of the airplane," she said. Sullenberger was primed to help passengers aboard the Airbus A320 survive the crisis, said Karlene Roberts, a university professor who co-directs the center. Sullenberger's resume is packed with achievements. After graduating from the Air Force Academy in 1973, he had a brief but distinguished Air Force career during which he flew the Vietnam-era F-4 Phantom fighter jet. He was a flight leader and training officer with experience in Europe and the Pacific and at Nellis Air Force Base, Nevada, where he was the mission commander for Red Flag exercises. The exercises are for advanced aerial combat training, a position delegated to top pilots. Among those who congratulated Sullenberger was Lt. Gen. John Regni, the Air Force Academy superintendent, who graduated with Sullenberger. "He not only showcased unbelievable airmanship, but exemplary character as well," Regni said. "In addition to superb judgment under utmost pressure, by checking his aircraft twice to ensure there were no passengers left behind he epitomized the 'service before self' concept we strive to instill in our cadets," Regni said. 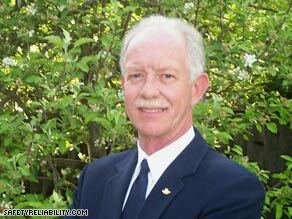 Sullenberger is president and CEO of Safety Reliability Methods Inc., a company he founded. The firm provides emergency management, safety strategies and performance monitoring to the aviation industry. He was an instructor and Air Line Pilots Association safety chairman, accident investigator and national technical committee member, according to a biography on the Web site of his company. He participated in several U.S. Air Force and National Transportation Safety Board accident investigations, and worked with NASA scientists on a paper on error and aviation, according to his resume. He was widely praised after Thursday's forced water landing, apparently caused by a "double bird strike," which crippled the plane's engines. "It was an amazing piece of airmanship," said Peter Goelz, a former managing director of the National Transportation Safety Board. Even New York's mayor had praise. "It would appear that the pilot did a masterful job of landing the plane in the river and then making sure that everybody got out," Mayor Michael Bloomberg said at a news conference Thursday. "I had a long conversation with the pilot. He walked the plane twice after everybody else was off and tried to verify that there was nobody else on board -- and assures us there was not." Sullenberger's wife, Lorrie, told CNN that his response wasn't surprising. "This is the Sully I know, she said. "I always knew this is how he would react. So, to me, this is not something unusual. It's the man I know to be the consummate professional." She also told the New York Post on Thursday that her husband "is about performing that airplane to the exact precision to which it is made." She said her husband, who hadn't spoken to the media as of noon Friday, was doing well. "He's feeling better today. He's a pilot. He's very controlled, very professional," she said. She divulged to CNN that she was stunned to hear the news from her husband after it was all over. "I hadn't been watching the news. I've heard Sully say to people, 'It's rare for an airline pilot to have an incident in their career.' "
"When he called me he said, 'There's been an accident.' At first I thought it was something minor, but then he told me the circumstances and my body started shaking and I rushed to get our daughters out of school."